Three MCH neurons in the hypothalamus region of a mouse brain are highlighted in green. In animals, these neurons are associated with high calorie intake and lower energy levels. Yale researchers have shown how the effects of these key cells are reversed. The findings, published in the Feb. 28 issue of the Journal of Neuroscience, describe the regulation of a family of cells that projectthroughout the nervous system and originate in an area of the brain call the hypothalamus, which has been long known to control energy balances. 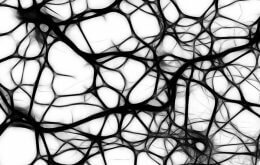 Scientists and pharmaceutical companies are closely investigating the role of melanin-concentrating hormone (MCH) neurons in controlling food intake and energy. Previous studies have shown that MCH makes lab animals eat more, sleep more, and have less energy. In contrast, other hypothalamic neurons use the thyrotropin-releasing hormone (TRH) as a neurotransmitter, and these neurons reduce food intake and body weight, and increase physical activity. The Yale study of brains of mice shows that the two systems appear to act in direct opposition, to help the organism keep these crucial functions in balance. Although TRH is normally an excitatory neurotransmitter, the Yale study shows that in mice TRH inhibits MCH cells by increasing inhibitory synaptic input. In contrast, TRH had little effect on other types of neurons also involved in energy regulation. “That these two types of neurons interact at the synaptic level gives us clues as to how the brain controls the amount of food we eat, and how much we sleep,” said Anthony van den Pol, senior author and professor of neurosurgery at Yale School of Medicine. The co-author of the paper is Xiaobing Zhang of Yale.